Yesterday it took us well over an hour to check-in and pass through security at Manchester Airport. First there was the queue to check-in which snaked across the check-in lounge. Then we had to queue to get into the area where they check your boarding card. Worst though was the queue to go through security. Just as well that we arrived at the airport in good time. Once through security, you have to snake through the duty free area to get to the gates. Not that you could buy anything there because there is no room in the overhead lockers on the planes to take extra bags. Now that budget airlines charge for hold luggage, more people are arriving with the largest cabin size case they can find which quickly fills up the space in the overhead lockers. Yesterday people brought so much onto the plane that some of the cabin luggage had to go in the hold. I did wonder what things will be like at the height of summer - a nightmare I dare say. Just when we hoped the weather was getting better! The taxi driver who took us to Manchester Airport yesterday asked us if it was always sunny in Spain. Well no! Sometimes it rains as it did last night when we came home from San Javier, sometimes it is just overcast and occasionally it blows a gale. 11.30: Benediction of the palms in the park "Huerto del Cura". Procession and Mass. 17.00: Celebration of the "Passion of Christ"
In the first half they will be playing the processional marches for Easter including "El Encuentro", by José Vicente Díaz. From the 29th of March to the 19th of April from 7pm you can see an exhibition of paintings by Maire Kalkowski in the Sala Polivalente. Seven British expats have been arrested in connection with the illegal provision of satellite TV on the Costa Blanca and Costa Cálida. More than 7,000 customers, mostly of British origin, are thought to have paid 890 euros for the decoder and installation and a further 15 euros a month for their channels. The offenders reportedly did not pay for the rights to the channels, nor did they declare their earnings for tax purposes. Their illegal operations could have netted around 30 million euros. Nine properties were raided in Los Montesinos, Rojales, San Pedro del Pinatar and Orihuela Costa. Guardia Civil officers seized 90,000 euros in cash, together with broadcasting equipment valued at around 600,000 euros. Four men and three women were detained and charged with offences against the tax authorities and intellectual property. An investigation was launched last year in August after police oficers became suspicious of an unusually high number of satellite dishes and decoders imported from the United Kingdom and Ireland at the home of one of the people now under arrest. They are said to have operated as a ‘ghost’ company, which did not appear on the registrar records and was not signed up to the social security office. Everyone knows that re-broadcasting British TV is illegal so why do people continue to sign up with these companies? Buying stolen TV programmes is really no different to buying any other stolen goods. Dozens of Britons have been arrested after Guardia Civil on the Costa Blanca have cracked what may be the largest documentation forgery ring operating in Spain. Three Britons based in Jávea and Torrevieja were behind the forgery ring and analysis of the evidence seized has enabled the identification of more than 100 expats living in Spain who are suspected of possessing forged documents. So far 50 British clients of the organisation have been tracked down and charged, mostly in Alicante Province. Many allegedly used financial documents to obtain mortgages or loans of between 200,000 and 1.5 million euros. These totalled over 60 million euros and affect 25 credit companies and banks. It always amazes me that there are folks who think that certain crimes are acceptable. I dare say many of the people who used the forged documents felt they were not doing any harm so that was OK.
On Thursday, MEPs voted in favour of Margrete Auken's controversial report about abuses committed by Costa builders. The report was based on the third visit by MEPs to the Costas to investigate complaints from hundreds of European citizens who have become victims of illegal building practices and land grab laws. This document paves the way for European funding for Spain to be frozen if action is not taken to halt the transgressions. Two separate bids by the Spanish Partido Popular (PP) and the Socialist party (PSOE) to water down the report were voted down after they failed to gain support from MEPs of other nationalities. We shall have to wait and see now if Spain decides to comply with the demands of the report and if they fail to do so, what action the European Parliament will take. We are now on stage three of our trip. After a few days in Sale with Laura and Dave, we've just had a few days with Jemma in Wolves. Now we are back in Sale again on the last leg of the trip. The company has been first rate and we have been looked after like royalty. However the pace of life in England is just too hectic for us and the weather doesn't suit our ageing bones. Although parting will be sweet sorrow, we will be glad to get home to sun and tranquillity. Looks like you could have a warm dry week ahead in Bigastro. Here though the weather is decidedly iffy. The warm sunshine that had brave folks out in shorts and T-shirts has given way to grey skies and a strong wind. This picture should provide a clue but not for those of you who have never been north of Watford. 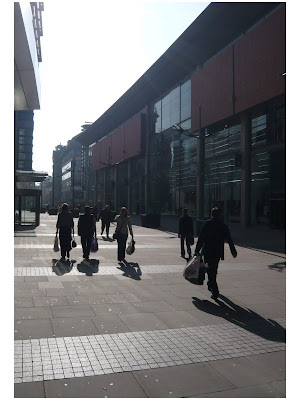 It was a pleasant sunny day for the shoppers in this cosmopolitan city. Some even braved it out in shorts and T-shirts. Those of us used to Spanish sunshine, preferred a coat and long trousers. Last night marked the end of this year's Fallas in Valencia en la noche de la 'Crema'. Today the city returns to its daily routine. In spite of the economic crisis, Nou Campamor produced the most expensive fallas in history. The 900,000 euro construction won them the first prize for the sixth year running. However they will not be competing next year, leaving others the opportunity to pick up first prize. The numbers of visitors to the city was down this year due to the crisis. Hotels reported 70% occupancy. Complaints about the noise and the disruption due to closure of streets were up though. In spite of these problems, the Fallas will return next year when Valencia will once again clear winter away to make way for spring. Now we await Semana Santa and the parades of pasos. I'm out of town for a few days. Although I have access to the Internet, I won't have the time to find the usual gossip and post it on my blog. Please accept my apologies; as the BBC used to say, "normal service will be resumed as soon as possible". The surprise will be that they will be closed because today is el Día del Padres. Whilst Mothers' Day may be very important in Britain, it is the fathers who get the recognition here in Spain. This morning, dads throughout the country will be pampered; they will be given the traditional present by their offspring and may even get a cup of tea in bed. Don't worry though, tomorrow it will all be back to normal and the carefully chosen tie will be relegated to the wardrobe with all the others. The Ayuntamiento in Bigastro very kindly delivered the following leaflets to our AGM last night. I've mentioned the Bigastel system on this blog before. There are a number of people at Villas Andrea who now subscribe to the system and speak very favourably of both the call quality and the broadband speed. Most important, the cost compares very favourably with other options, especially with the packages that Telefónica offer. For those who are not currently connected to the Internet, don't have a phone or who are not satisfied with their current service - Bigastel is well worth considering. And no, before you ask, I don't get any commission for advertising it! The Council of Culture in Bigastro has organised a trip to Madrid to watch the new musical comedy by Nacho Cano, “A” in the Häagen-Dazs Theatre. The dates for the trip areSaturday 28th to Sunday 29th of March. The price includes the coach, a night in the Hotel AGUMAR ****, breakfast and entrance to the performance. The price per person is 158 € (including entrance to the balcony) or 168 € (including entrance to the stalls). For more information and to subscribe, go to the 1st floor of the Ayuntamiento in Bigastro. The Council for Culture and the Council for Woman, along with the Municipal Library in Biagstro organised their 3rd Exhibition dedicated to Literature and the woman to coincide with the celebration of the International Day of the Woman Worker this month. On Tuesday at 4pm, the library held a coffee afternoon to present literature that the Municipal Library offers this group. The Villas Andrea Residents' Association was formed at a packed meeting held up at the Albergue in 2005 and was finally dissolved last night by a meeting of no more that forty people. Following the Treasurer's report, a vote was taken to decide whether the committee should continue. The result was unanimously in favour of continuing with a Residents' Association. The Chairman then announced the resignation of three members of the Committee including his own. In order for the committee to continue, they needed at least two new members including a chairman (or to be politically correct a chairperson). There were no nominations nor were there any volunteers. Reluctantly, the Chairman said that, in these circumstances, the Committee would not want to continue so VARA would no longer exist. The Residents' Association Committee did not always enjoy the full support of the community they represented. There were several stormy meetings where the atmosphere was tense and insulting remarks were made to both Allan and Jim during their terms of office. I believe that everyone who served on the committee did so with integrity and with the best intentions for the community at heart. However, if you bang your head against a wall for long enough it starts to hurt. Being a member of the VARA Committee was starting to hurt so it was probably as well to call it a day. I don't think we should let this pass without thanking all the people who sat on the Residents' Committee. In particular we should thank Allan White whose idea it was to have a committee in the first place and was chairman in the inaugural years. We should also thank Jim Ryder who took over from Allan last year. Lastly we should make special mention of Ron Hawes who has served faithfully on the committee since its inception. It may not have seemed so at times but we all appreciate what you have done on our behalf. Ryanair have announced that, as from October, it will no longer be operating check-in counters at Alicante Airport. Instead everything will be done online and passengers will be able to access their boarding passes as much as 15 days before they fly or as little as four hours before the flight is due to depart. Passengers who have not booked baggage on a flight will be able to go directly to the departure lounge controls and those who have baggage to book in, will be able to do so at a special ‘drop desk' check-in counter. The service will be free to passengers travelling with just hand baggage but a charge of five euros per person will be charged for those who register baggage, with a 10 euros charge being levied on those who turn up with luggage that has not been registered. The new system will be initiated in three phases starting on March 19. The first phase will allow non-EU citizens, people travelling with luggage and disabled people to register online. Phase two, which starts on May 1, will require people making new reservations to carry out the online check-in service for which a charge of five euros will be levied. Anybody turning up at the airport without a reservation will be charged 20 euros extra at the time of making the booking. On October 1, phase three will go into motion and all of the company's check-in desks at airports used by Ryanair will be closed. From this date all passengers will be required to do everything online and passengers who declare luggage will have to use the ‘drop desk'. Ryanair, like EasyJet, do not allocate seats to passengers so their check-in procedure is simple. Carriers like Jet2.com, Monarch and BMI Baby do allocate seats which obvisoulsy takes more time. You can book your seat online with these airlines but they charge you for the privilege. Calle Purísima, the main commercial artery of Bigastro, is to receive a facelift thanks to the Government funding (the Feil). Out of the 1,165,000 euro budget that the town will receive, 200,000 euros has been planned for this project in its first phase. A further 400,000 euros will come from the Plan de Obras y Servicios de la Diputación to fund the second phase. The mayor, Raúl Valerio Medina says that the street will be closed entirely to traffic which he claims will make it a more pleasant environment for shoppers. The centre of the street will have a stone pavement, the street lighting will be replaced along with the existing street funiture, there will be benches for people to sit on and ornamental planting to make it more attractive. Meetings have already taken place with the association of retailers of Bigastro, Acobi to discuss these plans. I expect there will be some opposition from those used to parking close to shops but on the whole, I imagine most will appreciate being able to walk along Calle Purísima without having to dodge cars and vans. It will certainly make shopping in the town a more pleasant experience and hopefully encourage people to spend their money in the town rather that go elsewhere. Setting a date for this year's AGM of the Residents' Association has been beset with problems mainly due to the refurbishment work up at the Albergue. For those who haven't caught up with the news - the AGM will now be held up at the Albergue tomorrow night (Tuesday 17th March) at 7pm and not on Wednesday as previously stated. The Committee would of course appreciate a full attendance. Each year, for the last 11 years, approximately 2,500 people have joined in a walk from Orihuela to Alicante in memory of the poet Miguel Hernandez who died in gaol in Alicante, 28th Marh 1942. This year the walkers will leave Orihuela on Friday the 27th March and will arrive at the tomb of Miguel Hernandez in the Cemetery at Alicante, on Sunday 29th. The three days walk is free of charge; the organisers (the Catalan Autonomous Government) provides breakfasts, meals and dinners, as well as the refreshments at the programmed stops. At the beginning and end of each stage there is information provided by the guides. The route,which is about 60 kilometres long, is divided into three stages; 20 kilometres from Orihuela to Albatera, 28 kilometres from Albatera to San Isidro and the final 22 kilometre stage from San Isidro to Alicante . The University Miguel Hernandez grants three credits to students who participate in the 'Footpath of the Poet' and four credits if they act as volunteers -managing equipment or acting as guides on the march. ... with a chance of a drop or two of rain by the weekend. The Orihuela district of San Bartolomé was the scene of a mass protest yesterday as five thousand people gathered on the high street to walk to Vega Baja Hospital under the platform 'Vega Baja Salud'. The people came from the municipalities of the area; Benejúzar, Catral, Jacarilla and Bigastro and from districts like Rincón de Bonanza.The political parties were also well represented with politicians from the PP and the PSOE. What the group are demanding from the Catalan Autonomous Government is a vast improvement in the medical services for the area. They want an end to “the interminable” delays for diagnosis and operations, they don't want patients having to be sent of to other hospitals for treatment and they want epidurals to be available to women in childbirth. They urgently demand their own Oncology Unit and the technological advances that exist in other hospitals. I'm not suggesting that these people are wrong to protest but our experience of the health service in Spain so far has been excellent and compares favourably with the treatment we received in England. The opening of the Fallas Festivities starts tonight with the Cridà, in which the mayor of the city, Rita Barberá and the 2009 Fallera Mayores, Marta Reglero and Inmaculada Escudero will stand on top of the Serranos Towers and invite Valencians to enjoy the celebrations. But really, the celebrations started on February 10th when the Ninots, exhibition was opened in the Nuevo Centro esplanade. The favourite ninot will escape being burnt at the Cremà and become part of the Fallero Museum as a ninot indultat (saved ninot). From March 1st through to the 19th, at 2 pm, in the Plaza del Ayuntamiento, they stage mascletaes. Mascletas are pyrotechnical extravaganzas composed of a series of fire crackers (masclets) that explode according to a certain rhythm ending with a spectacular explosion. After midnight, on March 15th, the plantà officially begins and all the Fallas monuments can be seen in the streets. Between the 17th and 18th, the traditional flower offerings to the Virgen de los Desamparados will be made. Thousands of Valencians will gather to offer flowers to the "Cheperudeta", the Virgin's popular name. All the Fallero Comissions will march dressed up in traditional costumes accompanied by musical bands towards an enormous reproduction of the Virgin located in front of the Basilica (where the original figure stands). The Falleras will leave their flowers which are used to create a colourful shawl for the figure of the Virgin. The last one to make a floral offering will be the Fallera Mayor of Valencia. On March 19th, the Cremà will take place. It's the moment in which the Fallas monuments will be burnt and transformed into ashes. It is the high point of the festivity as well as the saddest because it's the end of Fallas. Those of you with terrestrial Spanish TV will be able to watch all this on the local stations. The Valencian Association of Consumers and Users (Avacu) say that some of the 'kioscos' in the city are selling sweets that could easily be mistaken for firecrackers and thus pose a danger to young children. The designer of the sweets, the Valencian Felipe Báguenas, explained yesterday that this is a registered and patented product that has passed all the health and safety controls for its consumption. He adds that it is neither dangerous nor does it cause confusion. It is simply a souvenir of the celebration of the fallas, designed by a Valencian The fact that it looks like a class III firework which can only be sold to people over 18 makes it even more innocuous. Those of you who have visited the fallas will have seen young children carrying plastic carrier bags full of fireworks; you will have seen them thrown around the streets towards young girls and stood close to a raging bonfire in the middle of the city. At the end of the fallas they record the number of people injured and compare it with previous years. In comparison to all that, selling souvenir sweets must rank 0 on the danger scale. Spain without noise - is it possible? Apparently Torrevieja is to be noise mapped. The process will take 3 months and cost 57,000 euros. In 2002 the European Union established the requirement for noise levels of all major roads, industry, airports and rail traffic in areas where the population was over 250,000 to be mapped. This was to be followed up by similar surveys in smaller areas -the whole process to be completed by 2012. The follow up are action plans to reduce the effects of excessive noise by erecting sound barriers or acoustic fences. It is recognised that in areas where there are high rise flats alongside, for example, busy roads, the problems will be more difficult to resolve. The sound maps that have already been produced can be viewed at www.cedex.es/egra. To commemorate the 250th anniversary of the sculpture of 'San Pedro en su Arrepentimiento' (Saint Peter in repentance) by Francisco Salzillo, 1759, the Archicofradía del Pilar y Real Cofradía de El Lavatorio in Orihela, presented yesterday the restored image of the Saint. Following x rays using a machine that creates a 3D image from a series of views, the iron frame inside, that was damaging the wood has been replaced with a more suitable material. The statue has also been cleaned to remove environmental soiling and the oxidized varnishes that were masking the original paintwork. Finally the paintwork has been restored to bring back the colour and the depth of paint. You can see this magnificent sculptural figure in the Museo de Semana Santa and on parade during Semana Santa. The director of IVACOR has announced that by July they will finalise the process of restoration of the Glorious Standard of the Oriol. The restoration of the standard has been a slow process because it was badly damaged. For this reason and to avoid further damage to the fabric, the Glorious Standard will now be returned to Orihuela as a museum piece, to be displayed in a cabinet. National Police in Torrevieja have disarmed a band of four Spaniards who were storing between 15 and 20 kilograms of plastic explosives. The group are not linked to Islamic terrorists nor to ETA. Their intention was to use the explosives, which they had robbed from various quarries in the province, to open bank strong boxes. The neighbours from Molins are to meet with Encarna Llinares, the assistant representative of the Government, on the 25th of this month to to express their fear following a wave of robberies in the area. In the last month there have been several robberies with violence in the Vega Baja which have left people very nervous. The group say that the robbers can move with impunity using the motorways in the region. What they are seeking is a joint operation between the security forces, the Guardia Civil and Policía Nacional. In the same way that the police stop cars to carry out breathalyser tests, the group will suggest that the police should set up control points to stop cars and search them for stolen items. As if the crisis in the construction industry wasn't bad enough, Vicente Martínez, arrived at the premises of his company, Excavaciones Jovimar in Algorfa on Friday morning to find it had been cleaned out. The thieves took two trucks, a mini excavator, along with tools and machinery worth over 200,000 euros. Amongst the haul, there were three pneumatic hammers, a water extracting pump, a welding machine, a tarmac cutting machine, a pressure washer and 4,500 litres of fuel - none of which was insured. Once the thieves had broken in, they turned all the security cameras towards the ceiling and then took the video recorder and the tapes thus removing any evidence of the break in. The police suspect that the stolen vehicles may have already been transported on a trailer to Eastern Europe for sale. The fear in Algorfa though is that the thieves will use the machinery to commit further robberies in the area. SINGING AUDITIONS held for the benefit of the organisation, "MANOS UNIDAS"
This is being organised by the singing teacher from the Bigastro School of Music , Susanna Vardanyan . For next Saturday, 21st March, the Council of Promotion in Bigastro has organised the first "Gala del Comercio" which will be held in the Parque Municipal “Huerto del Cura”. The intention of this event is to showcase the range of products and services available locally from clothing boutiques, shops selling accessories for adults and children, shoe shops, opticians, beauty treatment salons, hairdressers, etc. The aim is to encourage people to look no further than their own town for these types of services. At the Gala, the results of the contest, “Dresses for a Queen” will be announced. You will remember that fashion students and designers were invited to produce designs for the dresses that the Queens will wear at the August Fiesta “San Joaquin 2009”. Our eldest daughter is coming to visit us in April bringing a friend with her. The person Jemma had originally booked to come with her can't come, so she is bringing someone else. Yesterday Jemma phoned the airline to change the booking because apparently you can't do this online. She was expecting an administrative fee to change the name of the booking. What she wasn't expecting was to be charged the difference between the price she had paid online for the flight and the full, non discounted price. As it worked out it would have been cheaper to have discarded the original booking and made a new one online. I call that ridiculous and an absolute rip-off. We will make sure that the two of them have a great time and it won't cost them a centimo whilst they are here. We have booked with BMI Baby for April and I couldn't believe all the little extras that kept getting added on , you even have to pay to book in, and for each suitcase, so this time only 1 suitcase between the two of us. I'm sure John can manage with just a few things to make room for mine!!! I have to say the whole budget airline business is becoming one big con. Why advertise tickets at ridiculously low prices when the real cost is going to be much higher? A price war between supermarkets in Spain is something we haven't experienced. Apart from the odd 3 for 2 offer, there has been so real sign of competition between the major players. In England we were used to this kind of battle between Sainsbury's, Asda and Tesco which made shopping around a money saving exercise. Mercadona and Lidl have already dropped prices on many of their goods and Eroski is launching discounts of up to 40% on some of its products. Now Carrefour has announced that it will cut the cost of 10,000 of its products by a massive 25 per cent. Hopefully the savings will help offset the damage that the exchange rate has made to our spending power. At a time of crisis, it is only natural that people want to find someone to pin the blame on. In England it seems to be the Poles, here it is the Moroccans. When times were good and there was plenty of work, the immigrant workers took on jobs that the locals wouldn't. In the present situation, where jobs are scarce, the locals want the immigrants out. An indication of this racial conflict can be seen in the municipality of Vila Joiosa, where threatening graffiti towards the Moroccans has appeared on walls - some of which was written in blood. This has graffiti has appeared in the parts of the town where Cáritas distribute food every Tuesday to the needy. Although Vila Joiosa has hundreds of citizens of different nationalities, the town has registered very few racial incidents. The Local Police say that now they are having to respond to more and more threats to the immigrants. There have been some confrontations in the street, which have forced them to close the Cáritas food distribution. In fact, there have been occasions when the Guardia Civil were called to calm the spirits down. A few months ago Cáritas were helping 100 families, now there are 15o who need aid. Out of the 4,000 people who are unemployed in the town, most are foreign workers from the construction industry. In certain UK newspapers, the problems of the world seem to have taken a back seat to the drama of Jade Goody's cancer as day by day they document her demise. As I remember it, Jade Goody appeared on Big Brother 3 in 2002 and became the target of ridicule in the British tabloid press for displaying an appalling lack of general knowledge. For example; she thought that Cambridge was in London. When she was told that Cambridge is in East Anglia, she assumed that meant it was abroad, and referred to it as "East Angular". Since her appearance on Big Brother, Goody has appeared on many TV reality shows and regularly appeared in magazines like Heat and OK! She had an autobiography published, has produced seven fitness DVDS and has perfume named after her. It would be wrong to say that she has no talent; after all she became a celebrity without any of the normal requisites for such status. It is sad that her life will shortly come to an end. Most people would want for privacy in her circumstances but I suppose for Jade Goody this is the ultimate reality experience. I have to admit, I shall be glad when the show is over and the world can focus on more pressing issues once again. One of my two followers - Jo, says about the weather, "Could you keep it like this as we'll be over 19 April for a week!" PS Jo lives in Dudley not far from our eldest daughter and has a house in Rojales. Jo writes an excellent blog which you will find at http://jojodesigns-jo.blogspot.com/. I'm pleased to see that the weather for this week is expected to be more normal for this time of year - light winds - plenty of sun and temperatures around the 20 mark. A failure to register crucial national insurance data properly since 1978 means that former state workers, including NHS, military and judicial staff, teachers and civil servants, have been underpaid. In some cases the average shortfall is £200 a year. Although the Government knows about the error, it has made no public statement and has not told pensioners whether they are entitled to redress. Instead, letters were sent out last week telling those affected that their pension would increase to the correct amount next month. In 1978 a number of public sector pension schemes contracted out of the State Earnings Related Pensions Scheme (Serps). As part of the deal, members were to receive a guaranteed minimum pension (GMP) from their occupational pensions, but the records were not properly updated. Staff in five pension schemes — the NHS, teachers, Armed Forces, judiciary and Civil Service — were affected. Capita Hartshead provides administration services for the teachers’ and civil service pension schemes. It has yet to complete its recalculations and so is unable to determine at present how many scheme members have been underpaid. Last night a spokeswoman for the Cabinet Office said that pensioners who had been underpaid would receive backdated payments, but she was unable to say when this was likely to happen. The spokeswoman said: “Before Christmas, the Government discovered a problem that affected several public service pension schemes that has resulted in a significant number of individuals being overpaid. The Government decided not to recover overpayments but to correct the pensions in payment from April 1, 2009. That seems fair. One question though - if Pam and I are affected can we have the back payments at the previous rate of exchange? Alicante City council, is considering reintroducing peregrine falcons into the city to control of the number of pigeons and thus reduce the serious damage these birds and their excrement does to buildings and monuments. The peregrine falcon feeds on smaller birds. Their presence also drives other birds away. For these reasons falcons are already used at airports like San Javier to keep the runways clear of birds. The plan is to introduce a pair of chicks in a nest box at Santa Barbara Castle where a lot of the pigeons that roam the city live. The chicks would need to be fed during the first few months until they were able to hunt for themselves. Then they could go to work driving the pigeons away. One of my neighbours asked me on Friday if I knew anything about BitTorrent. He was trying to download a film and it was taking forever. I told him that I had once made a foray into the world of free downloading using Emule but gave it up when the first film I tried to download took all night and then wouldn't play. To make matters worse, I wasn't enamoured by the idea that my Internet bandwidth was being eaten up by scores of people uploading material from my computer in return. I'm aware that there is a whole class of people that are no longer paying for their entertainment. They watch the latest films weeks before it opens in the cinema, they receive TV broadcasts illegally, they listen to free music and don’t watch television by episode but by series. I’m not enormously bothered by the legality or otherwise of any of this and I don't want to sound moralistic but the truth is that free downloading has already killed the music business. It is only a matter of time before it kills every other aspect of entertainment. First we have the almond blossom and now the orange and lemon blossom is starting to appear. The citrus blossom is nowhere near as showy as that of the almond trees but nether-the-less is still very welcome because it means that there will be fruit next year. Some would say that corruption can now be considered endemic in Spanish local politics. Week by week new cases are brought to light, investigated and eventually taken to court. However, the current investigation into the relationship between the PP party and promotional companies such as Orange Market takes investigations into corruption to a national level. Judge Baltasar Garzón wants to transfer the investigation into the “Gürtel”case to the Tribunales Superiores de Justicia de Valencia and Madrid, after finding implications that several in public positions with special legal protection could be involved. Among them are Francisco Camps, president of the Valencian Community; his number two, Ricardo Costa, Secretary General of the PP in Valencia along with Alberto López Viejo, Alfonso Bosch and Benjamín Martín Vasco of the PP. The magistrate of the National Hearing has also extended the imputations in this case to six other people from the PP: the mayors of the Madrilenian localities of Arganda del Rey and Pozuelo de Alarcón, Ginés López and Jesús Sepúlveda; Tomás Martín Moral, Clemente Aguado, José Galeote(ex- councilman of Boadilla) and Ricardo Galeote (ex- councilman of Estepona, Malaga. The judge says that the new ones who are imputed in the Gürtel operation would have received more than three million Euros worth of commissions in exchange for awarding contracts to the companies of the presumed ringleader of the plot, Francisco Correa. In addition, he adds that the three deputies of the PP of the Assembly of Madrid (Alberto López Viejo, Benjamín Martín Vasco and Alfonso Bosch Tejedor) could have received 1.2 million Euros from the companies of Correa. Besides Camps and to his number two, the judge has implicated the ex- secretary of Organisation of the PP in Valencia ,José Víctor Campos Guino and the head of the Cabinet of the Council of Tourism, Rafael Betoret Parreño. The judge maintains that the PP of Valencia received 420,700 Euros in commissions from Francisco Correa. He also affirms that the president of Orange Market, Alvaro Pérez, 'el Bigotes', paid Francisco Camps the sum of 12,783 Euros in return for of awarding concessions to the company. Shortly after hearing the public decision by the judge, the PP expressed their “total confidence” in Camps and the others who have been implicated. They consider the action of Garzón is out of proportion. The strong gusts of wind have blown off the plate from the house on Calle San Juan where the poet Miguel Hernández was born in 1910. The socialist councillor, Ana Mas says the breakage is a metaphor of the abandoned state of the building. In 2002, the President of the Catalan Government, José Luis Olivas made a commitment to restoring the building. Francisco Camps who succeeded Olivas later honoured that commitment . In 2007 a budget of 600,000€ was set aside for the project which was to be completed by April. Now seven years after the original commitment was made and nine months before the centenary celebrations of the poet's birth begin - nothing has been done. From November 9, 2007, people who purchased pre-paid mobile phones in Spain have been obliged to provide proof of identity, but for those who purchased phones before this date, a two-year period of grace was granted which runs out on November 9. It is estimated that more than 15 million pay-as-you-go phones are still unregistered in Spain. A recent consumer survey shows that 70 per cent of expats in Spain use unregistered pre-paid mobiles, and with time running out they have less than eight months in which to go to their individual operator and have their details recorded. The discount given for prompt payment of traffic fines in Spain is to be increased to 50 per cent from the current 30 per cent, according to an amendment presented last week in Congress as part of its review of new traffic-code legislation. The draft version proposed that the prompt-payment discount - given to those who pay within 15 days of being notified of a fine - be increased to 40 per cent, but all the parliamentary groups in Congress signed onto the amendment boosting the markdown to 50 per cent. The legislation, which also includes a restructuring of traffic fines and requires the Traffic Department to emit just one notification to offenders rather than the current three, is expected to go to full vote this month and to take effect before summer. Other amendments presented in Congress last week included requiring proof-of-insurance stickers on all vehicles, and requiring that all revenues raised through traffic fines be used for road-safety improvements. Further amendments called for minor speeding infractions to not result in a loss of driving-licence points, and for drivers to be allowed to recover six points through safe-driving classes, rather than the current four points. Since the 12-point driving licence was launched in July 2006, the Traffic Department has penalised drivers for a total of 6.2 million points (based on figures up to January 2009), and 14,000 drivers have had their licence suspended. The six municipalities that foundered the Spanish Network of Città Slow towns met on Thursday in Bigastro to define the organisation and the coordination of the official presentation of this network. In addition they also shaped up the system of financing that the network will adopt , the participation in events at national level and the municipality where the office will be located, which will be Lekeitio (Bizkaia). The philosophy of “slow cities” was born in Italy. Cittàs Slow are characterised by their slow, calm, hospitable, cultural and natural style of life. Besides Lekeitio and Bigastro the towns in Spain are Pals (Gerona), Rubielos de Mora (Teruel), Mungia (Biscay) and Begur (Gerona). Bigastro also has a policy for slow food which is characterised by a traditional way of cooking natural, locally produced ingredients. To be honest we were not aware that Bigastro had adopted the Città Slow philosophy when we decided to move here. That was just luck because the whole concept fits perfectly with the criteria for the place we wanted to retire to. Darren promised us great fish and chips and he delivered in spades full. As part of the refurbishment of the Albergue, the restaurant has been given a rethink. On Sundays they serve a traditional British roast dinner, there are theme nights planned, starting with Italian, basket meal are available in the bar and on Fridays the menu is fish, chips and peas served with bread and butter. Darren knows there is some good competition for fish and chips in this area. At Quesada they serve cod or haddock with chips etc during the day for 6€. In Catral, you can get a similar deal at the Inn Plaice. Syra's Restaurant had to come with something special to beat those two. Having been brought up in Yorkshire, I reckon know a thing or two about good fish and chips. After all I'd visited Harry Ramsden's when he had just the one restaurant in Guiseley. In places like Batley, Morley and Heckmondwike, a good fish and chip shop can be a gold mine for the proprietor. There are a number of factors that add up to a good fish and chip supper. First the chips have to be just right; golden and crisp and not greasy. More important is the fish which has to be white, firm and meaty. It has to be coated in a batter which is light, thin and crisp. The peas have to be properly cooked - mushy does not mean sloppy. Lastly it is always good if you get butter and not margarine with the bread and of course the the portions need to be generous. Last night's meal ticked all of those boxes especially the one about generous portions. I can't recall ever seeing fish as large as those that were served last night. They were huge, and hung over the sides of the king size dinner plates that the restaurant uses. I can say with certainty that nobody left Syra's restaurant hungry last night! Darren provided some nice touches, a half lemon to squeeze on the fish and plenty of tartar sauce which of course you didn't get at Harry Ramsden's. The only thing that was missing and I dare say you could have asked for it, was vinegar. Darren, a bottle of good quality malt vinegar on the table would have made the score 5 gold stars plus. My daughter's boyfriend Dave sent me this link to an panoramic photograph which was taken at the inauguration of Barack Obama using the Gigapan Epic. You can pan across and zoom in on any individual in the crowd - quite amazing. On Sunday, 22nd of March there will be a 'Marcha de Senderismo' for the benefit of the Asociación de Familiares Enfermos de Alzheimer in Bigastro. The walk will start at 9 am at the Plaza de la Concordia (C/ Jubilados). The price for participation is 3€. At the end of the walk there will be chocolate for all the participants. PS The word dorsales had me foxed at first until I realised that it not only means dorsal fin but a number that a competitor puts on their back. The Federación Valenciana de Municipios and the inisterio de Cultura have awarded Bigastro for its Recuperar la lectura perdida (to recover the lost reader) project that the Municipal Library has been promoting. This prize has been granted by the Comisión de Evaluación for the selection of projects within the Plan de Fomento a la Lectura, formed by the Dirección General del Libro, Archivos y bibliotecas, of the Ministerio de Cultura, and of the Departamento de Educación, Cultura, Juventud y Deporte of the Federación Española de Municipios y Provincias. Bigastro was given the same award in 2001, 2002, 2003, 2004, 2006, 2007 and 2008. Yesterday afternoon and last night it was blowing a 'hoolie'. It wasn't so much the wind itself that was unnerving as the gale force gusts that weaken structures and tear down fencing. You can see that Alicante Province (apart from the coast) is still on orange alert for today according to AEMAT. The wind is still gusting strongly - rocking my gazebo about in an alarming fashion. By tomorrow though the area is shown green which means no risk. The Popular Party (PP) said yesterday, that the summary of Operation Bigastro reveals that the ex- socialist mayor José Joaquín Moya benefited by about 800,000€ from the municipal coffers between 2006 and 2008. Moya is imputed for taking bribes, among others crimes. The spokesman of the PP, Aurelio Murcia, and the councillors, José Antonio Ricart and José Manuel Martínez say that the data in the document reflects the way Moya managed the City council in his 25 years as mayor. Murcia says that, when they were asked for information prior to the denunciations that lead to the investigation, Moya and the other councillors responsible declared that they knew nothing about urbanism because they weren't experts. Instead they blamed the technicians for the irregularities that had occurred. Today the Council will hold two extraordinary sessions. The first at the request of the PP party to clarify issues about urbanism in the town and the second which will also deal with some of these issues and other matters. The PP will request suspension of the work in Sector D-5 and solutions for the issues in Sector D-6 where the gas tanks were built on green zone land which was destined to be a park. They also will ask questions about the criteria used for preparation of the Council budget and the inclusion of VPO in the town planning. Additionally, the opposition party will request an audit and account balance, raise questions about expenses paid for trips, the use of municipal vehicles by people not employed by the council and finally ask why the ex mayor is being allowed to interfere with municipal management. The electrical companies in Spain (including Iberdrola) could return to invoicing every two months if the consumer complaints persist and irregularities in the invoicing information continue. Monthly invoicing was intended to give more information to the consumer and encourage savings to be made. However, the bills sent out are estimates which in some cases have differed greatly from the actual consumption. Promises to refund any overpayments have been met with a barrage of complaints. So, it is possible that we may be back to paying bimonthly in arrears as we were before. Snow, wind and cold are forecast today for the whole Iberian Peninsula. The State Agency for Meteorology (AEMET) has maintained its alert for all the independent communities, with the exception of the Canary Islands. In addition, 19 Spanish provinces are on orange alert which indicates an important risk. The Cantabrian cornice (the coasts of the Basque Country, Cantabria and Asturias) are on red alert for coastal winds and on orange alert for snow. The snow level will be around 400/700 metres in the north of the peninsular , 700/1,000 metres in the central zone and the Balearics, and 1.000/1.300 metres in the south. Civil defence have also, alerted the Spanish Airports and Navegación Aérea (AENA). The wind has already caused problems in Madrid where a billboard is blocking access to the capital on the A2 from Barcelona. In Ceuta, the strong winds have forced the suspension of classes, affecting 15,000 students and people are advised not to leave their houses. In addition, communications with the mainland have had to be cut. Yesterday afternoon, gusts of wind of more than 60 kilometers per hour, destroyed the roof tiles on more than 20 houses in Ceuta and forced the cancellation of marine traffic between the ports of Ceuta and Algeciras (Cadiz). In Andalusia, two buildings in Beds (Seville) and Cadiz collapsed in the strong winds. The advice is to only travel by car if it is necessary and if you intend to use the motorways, drive with caution taking heed of the recommendations from Trafico. Driver are also advised to take warm clothing and a mobile phone with a spare battery with them. The stormy weather yesterday did provide me with some dramatic sky shots. These were taken as the wind started to pick up. Much as I love these kind of photo opportunities, I'd prefer the boring clear skies that we are used to. One of the words that cropped up in our lesson yesterday was 'leyenda'. We knew what it meant because we remembered the film "La leyenda de Zorro" (The Legend of Zorro) starring Antonio Banderas and Catherine Zeta-Jones. Our teacher, Eduardo asked if we knew the legend of Bigastro. Of course we didn't. He went on to explain that Bigastro existed as a settlement in 1701 with 16 families who rented land from the Cathedral in Orihuela. The labourers who worked the land were very poor and starved. The legend of Bigastro was therefore one of robbers because the people had to resort to going out at night to steal food from the land or from the market in Orihuela to feed themselves. Mel from the Residents' Committee has kindly produced this notice providing information for drivers. Many thanks Mel. I have to renew two of the classes on my Spanish licence and need a medical certificate to do so. I now know where to go for one. The Ayuntamiento in Bigastro have posted this warning on their web site. The Centre of Coordination of Emergencies of the Catalan Autonomous Government predict for Wednesday 4th of March: strong winds from the west with gusts that can reach 70km/h. I hope this doesn't bring Carol's fence down again on C/Le Vigan. They've only just put it all back up. 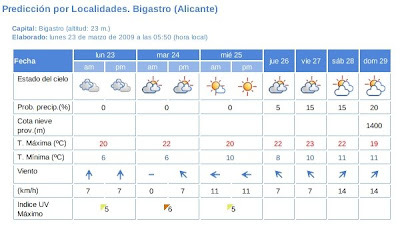 According to AEMET the wind will pick up in Bigastro tomorrow afternoon reaching 43km.h and will then ease on Friday to 36km/h dropping over the weekend to a breeze on Sunday. Let's hope they are right and the Centre of Coordination have got it wrong. Those who have visited Orihuela recently may have noticed that the Council have put up new signs in the old part of the city. However, it seems that the plates with the old names of the streets that the council of Culture have put up at 22 points are plagued with orthographic errors. You will find the words "fué", "mas" (adverb), "tambien" or "albergába" on the plates which I assume the critic implies are written incorrectly e.g. accented characters that should or should not be there. Of dear! If only my Spanish was good enough I would be able to tell you what the signs should say. Looking at this list, Bigastro is not a town short of a place to go for a meal or a drink! RESTAURANTE "LA PEDRERA" Fusión entre cocina de autor y traditional. RESTAURANTE "LA ALBORADA" Especialistas en Cocina de Innovaci6n con pequeňos toques tradicionales. RESTAURANTE "CAMPING LA PEDRERA" Especialistas en comidas: arroz con conejo y serranas, y platos combinados. BAR "TONI" Especialidad en comidas caseras: albóndigas, arroces, guisado de pipitoria y todo tipo de tapas. CASA "ELOINA" Especialidad en banderillas, patatas asadas, y habas hervidas. RESTAURANTE "EL SARO" Especialidad en comidas (Pala de Cabrito), menus diarios y tapas variadas. PIZZERIA "PASARELA" Podras disfrutar de pizzas, hamburguesas y platos combinados. RESTAURANTE "LA ARROBA" Cocina moderna bajo los parametros del Slow Food. BAR "LOS CANDILES" Especialistas en tapas variadas. CERVECERIA "CIBELES" Especialistas en tapas variadas: mejillones a la plancha y manilas de cerdo. BAR "VARGAS" Especialistas en comidas caseras y pollos asados. RESTAURANTE "EL POLIGONO" Especialidad en cocido con pelotas y arroz con conejo. Tapas de ternera con tomate y postres caseras. BODEGON "LOS CUATRO VIENTOS" Almuerzos y especialidades en Pezuňas, Callon y Conejo con patatas. BAR "LA TERRAZA" Desayunos y almuerzos. Especialidad en tapas variadas. PASTELERIA - HELADERIA "RIOS" Montaditos, pasteleria y helados. MESON "SAN JOAQUIN" Especialistas en tapas variadas y carnes la brasa. BAR "AVENIDA" Especialistas en desayunos y tapas. The Council for Women in Bigastro celebrates the International Day of the Working Woman by paying tribute to the woman of 2009. A group of over thirty people playing brass and percussion. A concert of lyrical music (opera, zarzuela, Spanish songs, ballads, etc.) performed by the soprano Susanna Vandanyan accompanied on the piano by Iryna Zhebrún and on the guitar by José Jimeno. The Council for Citizen Security have acquired a new car for the Local Police. The councillor for Citizen Security, Inmaculada Martínez and the Local Police know first hand the benefits of their new vehicle which is equipped with everything necessary to act in any emergency. This acquisition will make it possible for the police to respond faster and more effectively to the demands of the neighbours of Bigastro. In the early days of computing, laptops were bulky and heavy devices Their lack of portability meant that security was not an issue. Nowadays laptops are a lot less bulky - security has become a big problem. Thousands off them get lost and stolen each year. Most are not recovered, partly because they can't be easily identified. An early solution to the problem of security was a cable that you attached to the laptop and secured to a desk. Hardly elegant and totally ineffective against the well prepared thief. More recently, software solutions have come onto the market. The latest program is called Retriever, produced by Front Door Software Corporation, a small company based in Evergreen, Colorado. Once you have reported the laptop missing, the company website sends a message to it and a banner pops up on the screen. It can also play a recorded message to the thief, "get your hands off me you dirty scumbag" or whatever else you choose to record. If a thief accesses the internet with the stolen laptop, Retriever will collect information on the internet service provider in use and nearby wi-fi access points, so that the police can be alerted to its location. The Retriever software package costs $29.95 (15.65€) for a three year licence. A small price ot pay for peace of mind. You can even download a free trial from the company's website. At the weekends you often see pigeons flying overhead in a flock; swooping and turning from side to side until eventually they settle on the ground. What they are actually doing is taking part in a competition. In the flock is one female bird the rest are all males who of course will follow her wherever she goes. The most macho male bird who stays closest to the female in the air is eventually declared the winner. The wings and bodies of the male birds are painted with dye to enable them to be identified in the air. When we first saw them, we thought the brightly coloured birds were parrots! The problem is that you never know which way the birds are going to fly and where the female will eventually decide to land. So the bird's owners and the followers have to chase around in their cars to try and keep up with the flock. Once the birds settle to the ground, the whole group will descend on the spot. Yesterday, the female decided to come down in my neighbours garden in one of their bushes. The female is somewhere in there being mobbed by all her suitors. The owners congregate to see what is going to happen. The competition finished at 7pm. Until then the pigeons had to be left to their own devices. After all they may have taken to the air again. Once the competition was over, the steward removed the female bird from the bush and the male suitors followed. The last bird coming out of the bush. When all the pigeons were on the ground, one of the other stewards passed them over the gate to the owners and peace was restored. The man whose bird had won was delighted - his prize was 1,000€ . PS The bird adorned in the colours of the Spanish flag (bandera) seems to be the least interested of the lot. Perhaps he's a maricón! Nobody can accuse Jóse of not trying. He has spent a lot of time, effort and money making the Albergue at La Pedrera the type of venue that we have asked for. Following a fortnight's closure, the Albergue was re-opened last night. The singer was booked, the bar was stocked and the invites had been sent out. All that was left was for us to turn up. Things didn't go as smoothly as Jóse had hoped. The paint, which I presume had been applied that day, wasn't quite dry so it was as well not to touch anything that was coloured brown - including the bar. After one hour, the lights went out. Fortunately the singer could continue because there was power to the stage but unfortunately the pumps weren't working so it was bottled beer or spirits. Not to be fazed, Jóse called an electrician who got the power back on so the party could begin in earnest. The dance area was packed, the tables and the new sofas were full - everyone was having a great time. I'm not sure when the party finished but I imagine it was sometime during the early hours of this morning. Today, Jóse is serving Sunday lunch to a full restaurant. I'm sure it will be good and prove to be a great success. Later on there will be theme nights and fish and chips on Fridays. Not quite your authentic Spain but it is what people have asked for. The Chairman of the Residents' Committee has asked us to give the venture our support - I'm sure we will. Bigastro has a reputation for its music. Last night's concert at the Auditorium showcased three highly talented young musicians;- one on the tuba and two flautists. They each chose demanding pieces which they performed flawlessly demonstrating both their skill and musical presence.